Through a distinctive combination of a core curriculum–based liberal arts foundation, hands-on learning opportunities, faculty mentorship, and skill-building experiential education, University of Puget Sound students are uniquely prepared to continue studies and pursue careers in health professions upon graduation. Diversity: 25% of students identify as students of color; 60% of students identify as female and 40% identify as male; 14% of the incoming class are the first in their families to attend college. All applicants are automatically considered for academic scholarships ranging from $13,000–$24,000 per year. Admission Information: Puget Sound is test optional. We offer Early Action, Early Decision, and Regular Decision. The application fee is $60. The average GPA of an admitted student is 3.50. University of Puget Sound is a national residential liberal arts college with 2,400 undergraduate students from 43 states and 10 countries. Located in Tacoma, Washington, we are centrally located in the heart of the Pacific Northwest between Vancouver, British Columbia, and Portland, Oregon, and just 35 miles south of Seattle. The region offers diverse cultural, artistic, and social opportunities, as well as numerous recreational activities on Puget Sound and in the nearby Cascade and Olympic Mountain ranges. We offer more than 50 traditionaland interdisciplinary areas of study,with innovative options including Bioethics; Environmental Policy and Decision Making; and Science, Technology, and Society. With an 11:1 student-faculty ratio, teaching is a priority for faculty members, who are known for being accessible, approachable mentors; take a collaborative approach to learning; and are generous with their time. Students pursuing Pre-medicine or Pre-health meet regularly with staff in Health Professions Advising to decide which future career may be best and how to meet the academic and other requirements for health professional schools. Students also participate in mentorship programs, interview workshops, and an annual networking event hosted by Career and Employment Services. On campus, state-of-the-art facilities allow students to pursue advanced research. Puget Sound’s Science Center is an integrated complex that fosters interdisciplinary discussion and discovery through interdepartmental interaction. Independent research and inquiry-based labs are available to every student, not just upper-level students or Science majors. Students can apply for competitive grants that provide stipends for full-time independent research over the summer. Several of Puget Sound’s more than100 different student-run clubs and organizations are science themed, such as Puget Sound’s chapter of Global Brigades, which offers service programs in Public Health and Medicine; Elements, a student-run science magazine; and the Phi Sigma Honor Society, which hosts research symposia and organizes tutoring groups. Puget Sound students also volunteer and intern with local hospitals and clinics, and job shadowing opportunities are available through the Washington Academy of Family Physicians. Puget Sound graduates enjoy an acceptance rate to medical school that is far above the national average and are admitted to top programs at institutions including Harvard, Stanford, UCLA, and others. While many students pursue careers as medical physicians, other students explore alternatives in public health, dentistry, nursing, or veterinary medicine. 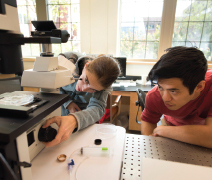 While mainly an undergraduate-focused institution, Puget Sound also offers specialized graduate degrees, as well as Schools of Occupational Therapy and Physical Therapy. Both feature on-site clinics run by students, providing care for real clients from the surrounding community. Undergraduate majors such as Exercise Science, Natural Science, and Psychology are excellent areas of study for students interested in Occupational or Physical Therapy. 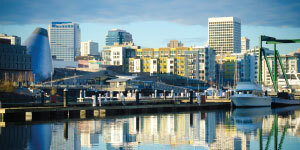 The best way to get a sense of the Puget Sound experience is by seeing us in person. Go on a student-led tour, sit in on an information session, and meet with professors and coaches. Interviews and overnight visits are also available. To register, go to pugetsound.edu/visit.